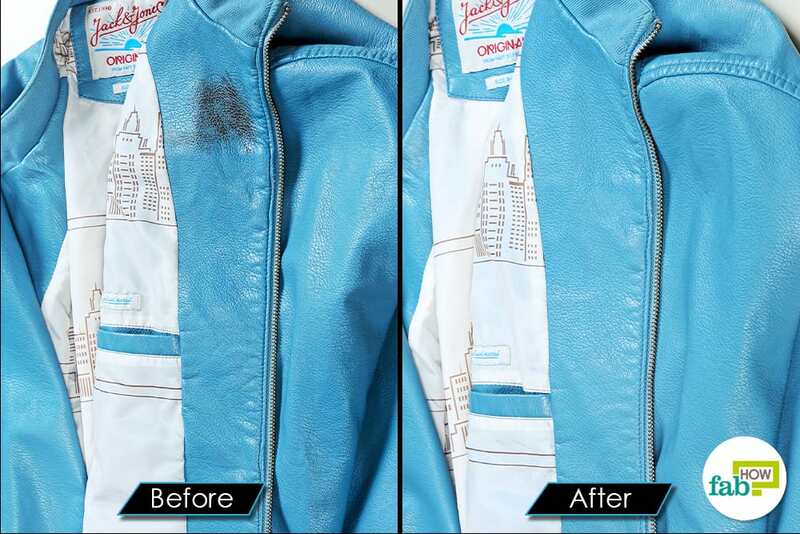 Someone accidentally spilled on your favorite leather jacket at a party, or perhaps you got grease on it while honing your motorcycle. Now, you’re trying to figure out a way to remove the stain without damaging the soft leather. 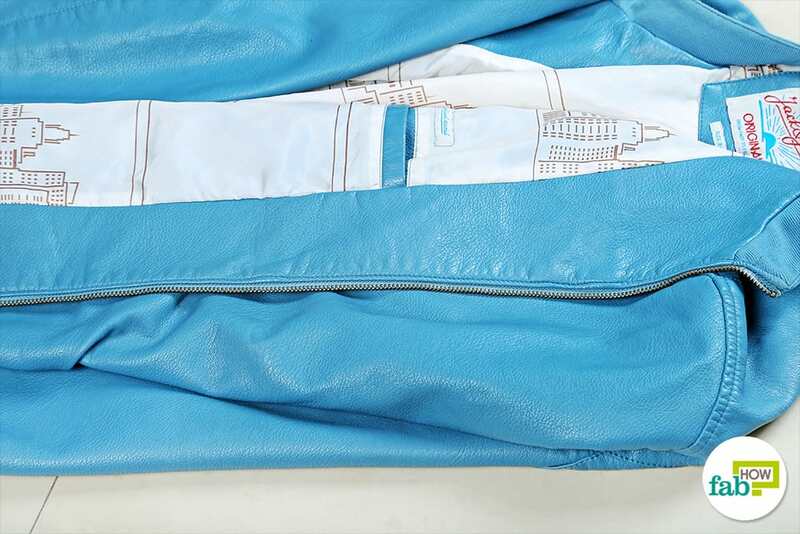 The leather is one of the most versatile materials and can be used to make everything from studded jackets, skirts, footwear, pants and purses to upholstery covers and car seats. While leather goods are highly coveted, they cost a pretty penny and can be ruined easily. Therefore, one must handle them with care. 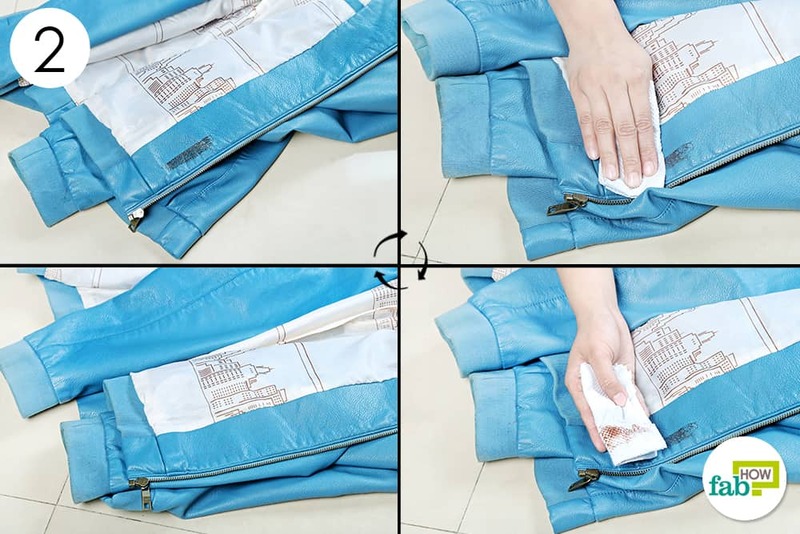 However, if despite your best efforts, you do get a stain on your leather, it can be quite a task to clean it without seriously damaging the delicate material. 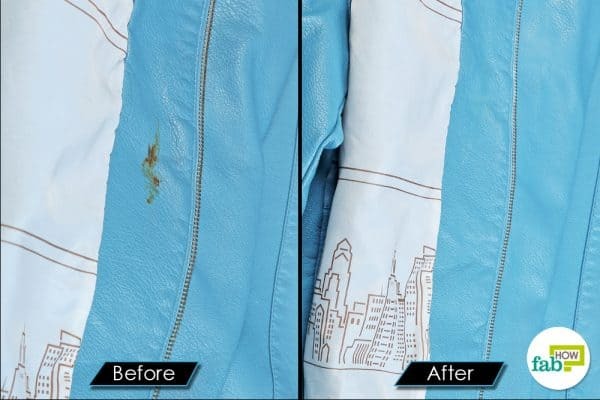 The best thing that you can do when anything is spilled on leather is to immediately wipe off as much of the stain as possible. As for the rest of the cleaning process, we bring you eight tried and tested hacks on how to clean leather with minimum fuss and effort. You can try out whichever one suits you the best. Do let us know how you fared in the comments section below. 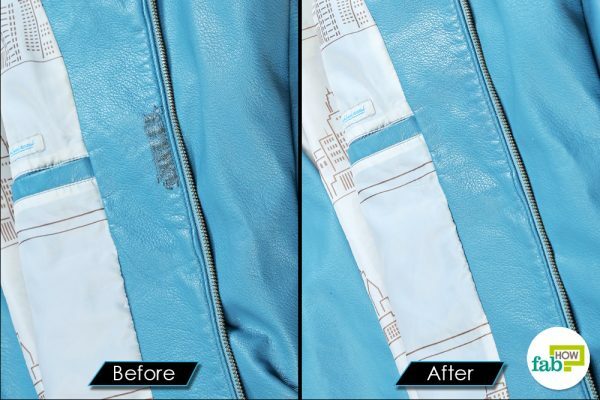 An ingenious way to clean leather is by making your own stain remover with simple household ingredients like white vinegar, olive oil, and lemon essential oil. 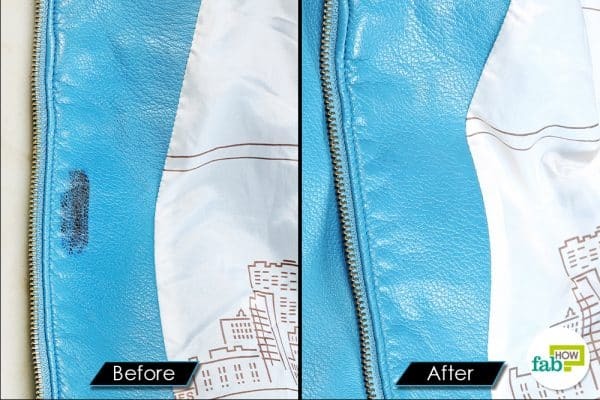 You can clean your leather car seats with it or even your favorite leather jacket. White vinegar acts as an effective stain remover, and the combination with lemon essential oil will work to break down dirt and grease. The olive oil will soften the leather and protect it from harm. 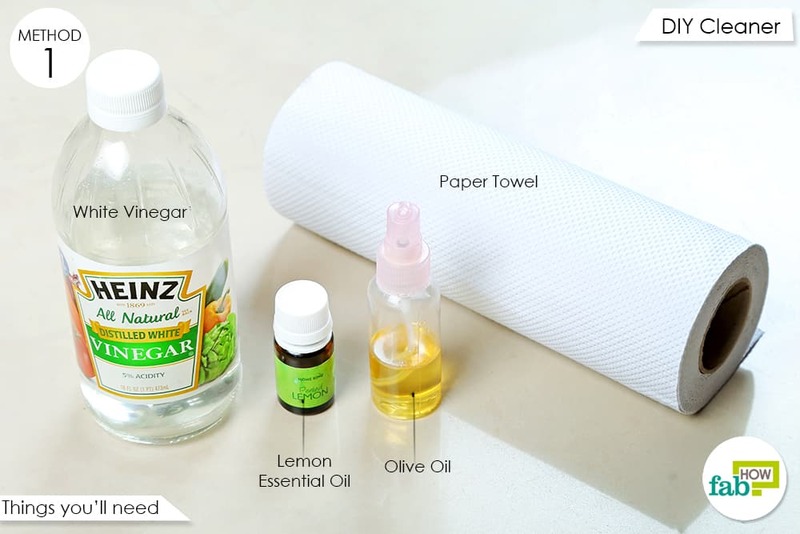 This DIY cleaner is particularly useful for removing oil, grease and food stains. Plus, you can use it to restore the shine to your leatherette sofa. 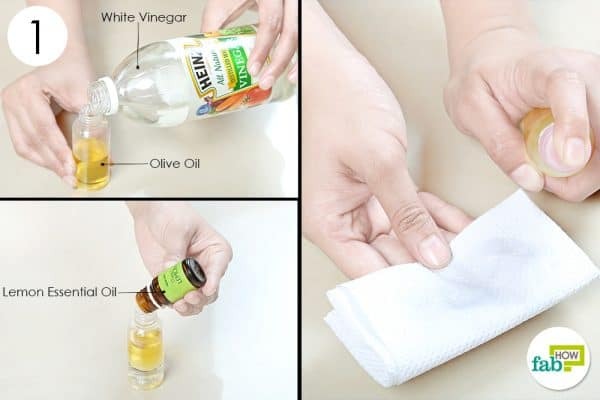 Put 2 tablespoons of olive oil into a small spray bottle. Add 2 tablespoons of white vinegar. Add 10 drops of lemon essential oil. 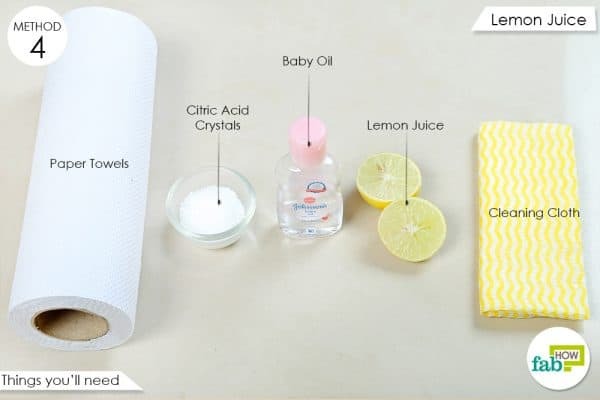 Fold a paper towel and spray the cleaning solution on it until it is fully saturated. Gently dab the stain with the soaked paper towel. As you continue dabbing, you will notice the grime transferring to the paper towel. If the stain proves to be stubborn, you can spray some of the cleaning spray directly on it. Let it sit for 10 minutes, then wipe it off with a paper towel or microfiber cloth. You can also mix liquid dish soap and water as a simple cleaning solution for leather. For best results, use Dawn dish soap. It is a mild yet effective cleaning agent and will not damage the leather. This method is also highly recommended for cleaning your leather boots. 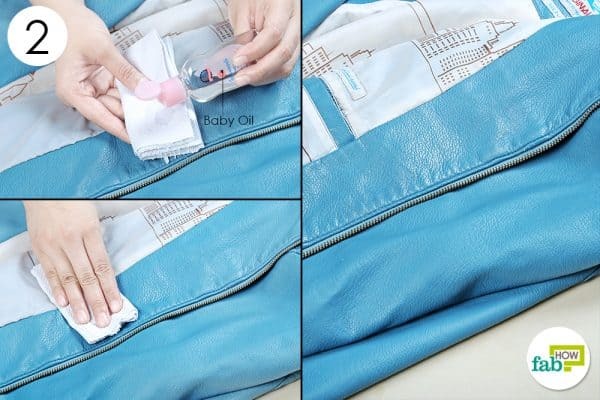 You can also use a mild dish soap or baby shampoo to clean your leather handbags as well. Fill a small spray bottle with water and add liquid dish soap. The ratio of dish soap to water should be 1:8. Shake the bottle to mix the solution well. Spray the cleaning solution on a wadded paper towel. Blot the stain several times. If the paper towel becomes too dirty, prepare a fresh one and continue blotting. You can prepare fresh cleaning pads and repeat the process several times until the stain is completely gone. 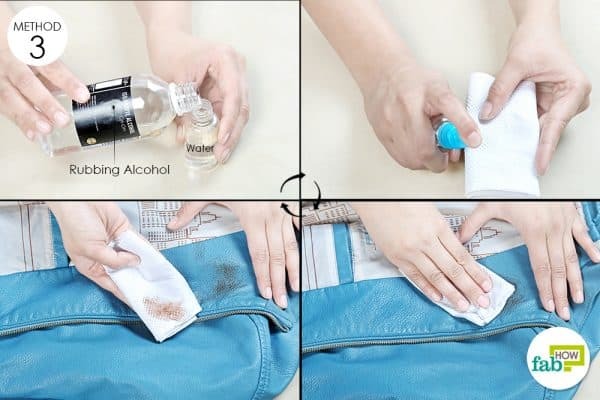 Rubbing alcohol acts as a powerful disinfectant and cleaning agent and can be used to clean everything in your home from your kitchen surfaces to your makeup brushes. 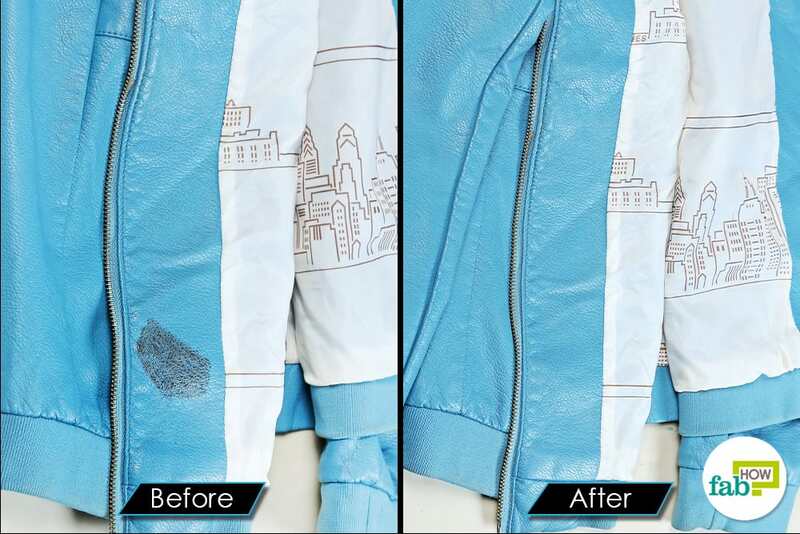 It is especially effective at breaking down permanent marker or ink spots, not to mention oil and grease stains. Therefore, you can you use rubbing alcohol to remove even the most persistent of stains from leather. 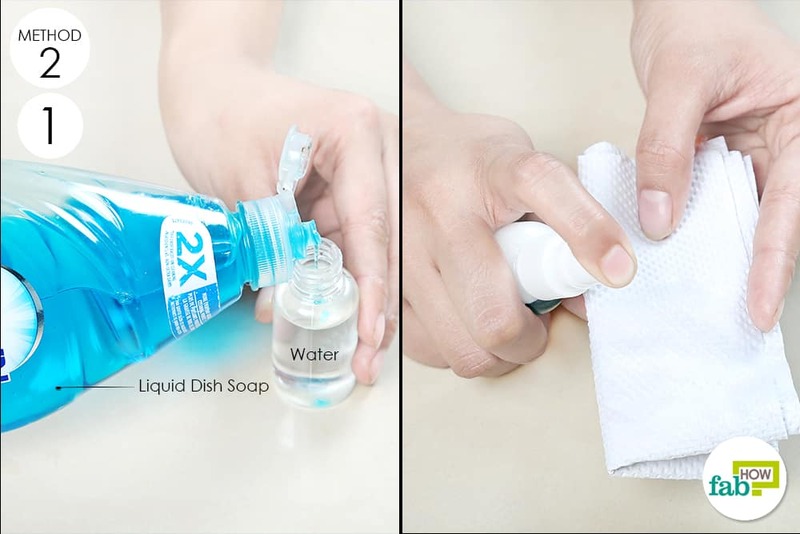 Pour 2 tablespoons each of rubbing alcohol and water into a spray bottle. Spray some of the solution on a folded paper towel and gently dab the stain to break it down and dissolve it. Continue dabbing, and you will notice the residue transferring onto the paper towel. Saturate more paper towels with the solution and continue dabbing until the stain is gone completely. Lemon juice can be combined with citric acid crystals to form a doubly potent cleaning agent that can remove even the toughest of stains. However, since this mix can be a bit harsh, follow it up with an application of baby oil to prevent the leather from drying up and cracking. 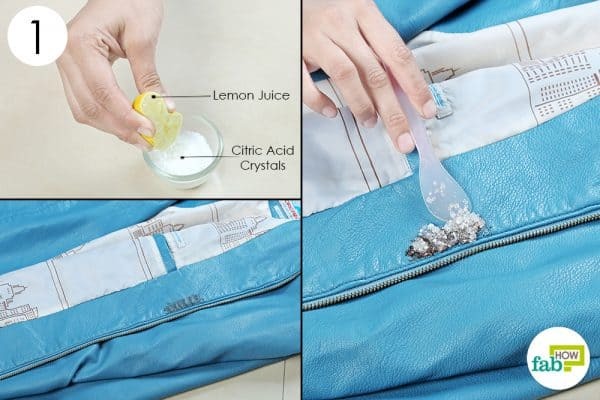 Put 1 teaspoon of citric acid crystals in a small mixing bowl and squeeze in enough lemon juice to make a thick paste. Mix well and apply the paste on the stain. Let it sit for about 10 minutes. The high concentration of citric acid will break down the hardened stain. Afterward, wipe the area clean with an old cleaning rag. 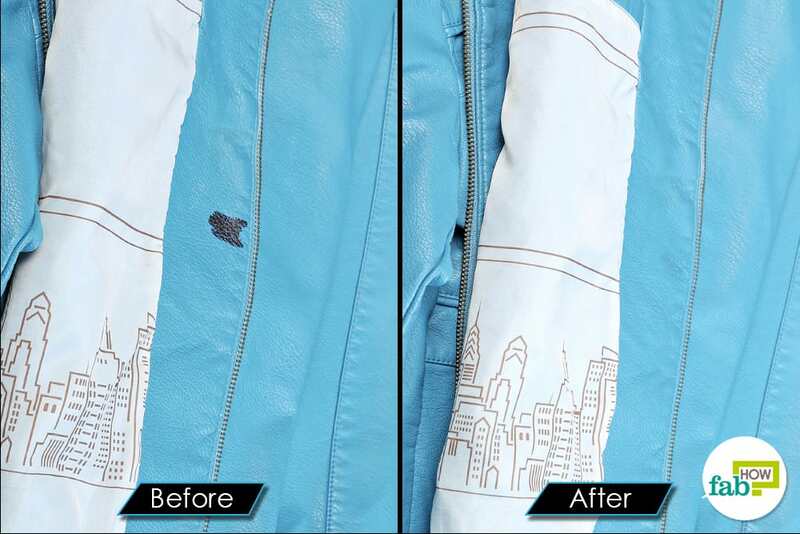 Once you’re done with the cleaning, put some baby oil on a paper towel and gently rub it into the cleaned leather. This will moisten and soften the cleaned area and prevent it from becoming too dry and cracking. 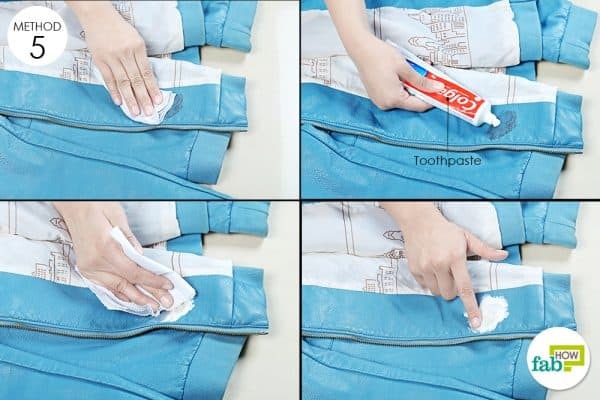 Did you know that white toothpaste not only keeps your teeth bright and clean but can also be used to cleaning around the house and remove stains? White toothpaste contain abrasive substances like calcium carbonate, silica and aluminum oxides for cleaning. At the same time, their formula ensures that the paste is gentle on your teeth. 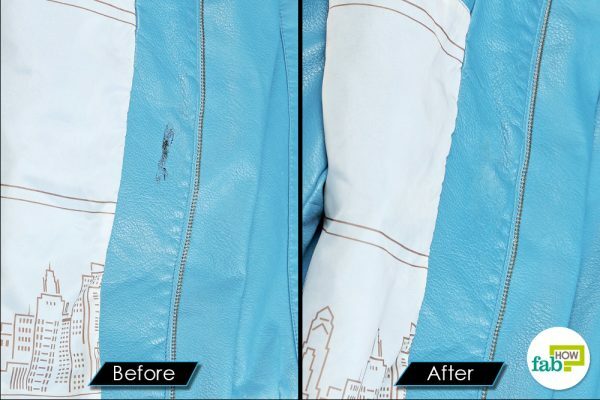 This is why it can be used to clean leather without causing damage and removing all types of stains. Lightly moisten the stained area using a damp paper towel. Squeeze out a pea-sized amount of white toothpaste and spread it over the stain with your finger. Leave it on for about 5 minutes, then wipe it off with a damp paper towel. The stain should be gone. 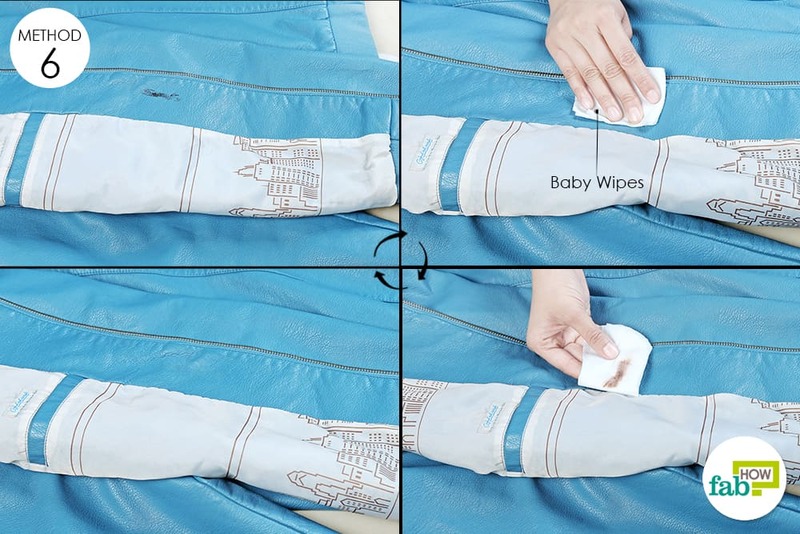 As baby wipes are made for an infant’s delicate skin, they can be used to remove light stains from leather without any worries. Gently buff the stain using baby wipes to get rid of it, while carefully preserving the integrity of the leather. 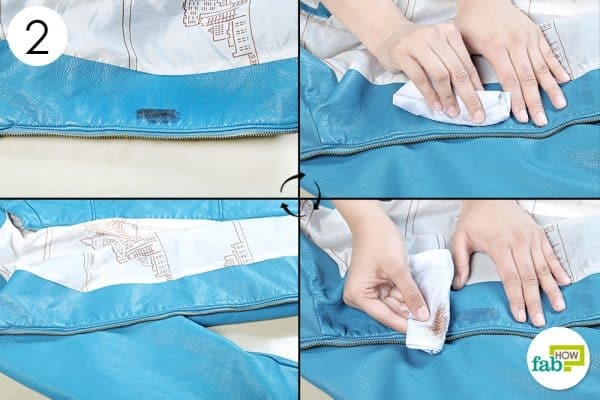 Gently buff the stain using baby wipes until it is completely gone. Do not rub the leather harshly or it may cause tearing and damage. Baking soda is an incredibly useful ingredient to have around the house, and not just for baking heavenly goodies. 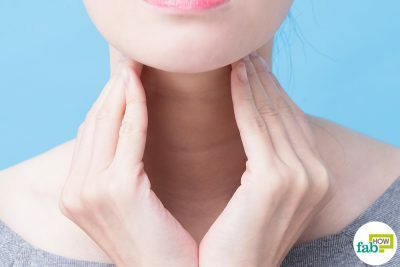 It can also be used for cleaning, odor removal, and even skin care. As far as leather is concerned, you can use baking soda to absorb and remove stubborn oil or grease stains and look like a pro while doing it, too. Sprinkle baking soda on the oil or grease stain. Leave it for a few hours to allow the baking soda to absorb the oil or grease. Afterward, wipe off the baking soda and voilà! The stain will be completely gone. 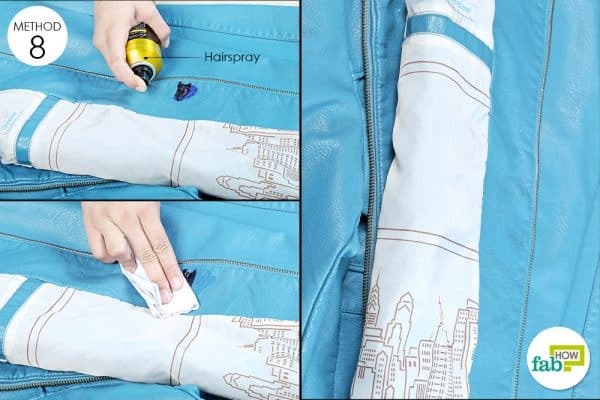 Whether it is a permanent marker or hair dye, hairspray can be used to break down and remove the hardest of stains. You probably prefer a hairspray without alcohol for your hair. But for stain removal, go for a cheaper variety that contains alcohol, as it helps dissolve the stain. Squirt hairspray to clean leather with minimum effort. Blot it with a wadded paper towel to absorb the dislodged particles. Repeat until the stain is completely gone. You can also use a mixture of white vinegar and linseed oil to clean leather. Just mix 2 parts linseed oil with 1 part white vinegar, and apply the solution on the stain. Leave it for 12 hours, then gently buff the area. 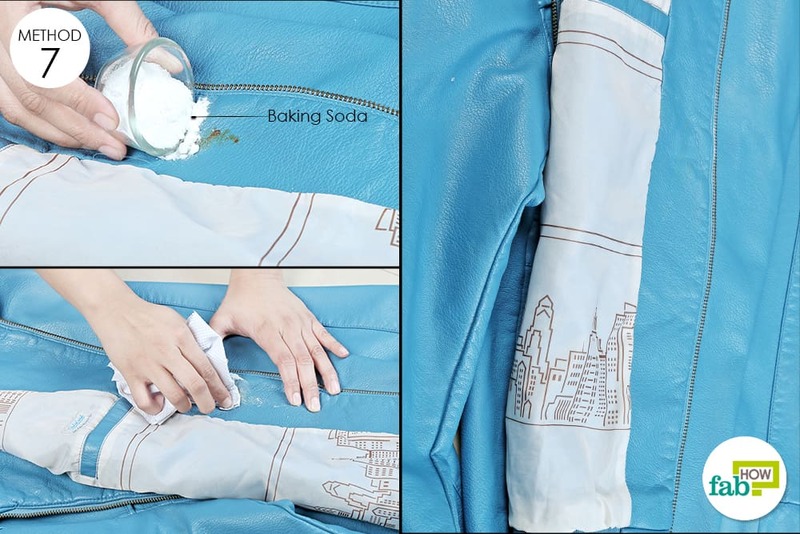 You can also use cornstarch to remove oil or grease stains from leather. Simply sprinkle some cornstarch on the stain and let it sit for a few hours. Afterward, wipe it off with a paper towel or an old cleaning rag and see how the stain comes off along with the cornstarch. As a bonus, you can also use white toothpaste to remove scuff marks from leather shoes. Just rub a bit of toothpaste on the scuff marks with a soft cloth for a minute or so. 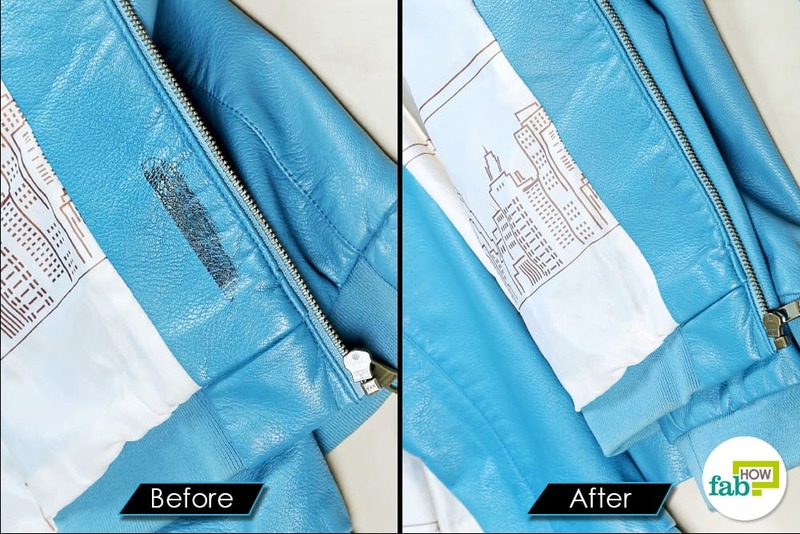 Wipe it off with a damp cloth and voilà! You will see that the scuff marks are gone.